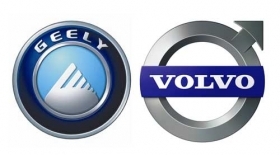 BEIJING -- Geely Automobile said its parent, Zhejiang Geely Holding Group, and Volvo have signed a technology transfer deal that will allow the Chinese carmaker to enrich its product portfolio and boost its competitiveness. The deal includes jointly developing electric vehicle and small-car technology, including plug-in vehicles, Geely said in a statement on Friday. "It's a strategic imperative for us to try our best and unlock the synergies within the group, enhancing our different brands," said Li Shufu, chairman of Geely Holding Group. Volvo CEO Stefan Jacoby said: "This is an initiative which is set to create additional value for both companies. It will support us in realizing the aspirations to make China our second home market." Zhejiang Geely bought Swedish automaker Volvo from Ford Motor Co. in 2010, marking China's largest overseas auto acquisition and reflecting the country's rapid rise in the auto world. The deal, however, raised fears that a Chinese takeover could tarnish Volvo's image as a long-established upscale brand. To ease the concerns, Li has stated publicly that Volvo's independence would be maintained. "Geely is Geely, Volvo is Volvo," Li has said on several occasions. Even though technology sharing between a parent and its subsidiary is not unusual, industry observers warned about operational difficulties in executing the plan. "Geely is the obvious beneficiary of the deal. But they should be extremely careful in executing the sharing as it could tarnish Volvo's image as a premier brand," said Yale Zhang, president of consultancy Automotive Foresight (Shanghai) Co Ltd.
Volvo is waiting for Chinese government approval to build a greenfield manufacturing plant in Chengdu in southwest China. The plant would also produce a new brand jointly developed by Volvo and Geely.